Over a thousand sold all over the world! Made in America - Abused World Wide! Don't miss out on our combination packages that include a winch, shackles and discounted shipping to the lower 48 states! Don't want to add a full replacement bumper to your FJ just so you can mount a winch? You are not alone. Full replacement bumpers are 100-150+ lbs, degrade aerodynamics and are expensive. Keep your stock bumper cover, classic FJ looks and your MPG with the installation of this winch mount within and behind the stock bumper cover. Add a pair of shackles above if needed. Designed and built in Texas! 1" wide shackle mounts are drilled .890" ID for .875" OD or smaller pins which is common for a 3/4" shackle. Pin sizes can vary. We offer Van Beest shackles which will fit our shackle mounts. Mounting ear reinforcement plates for maximum clamping force. Lighter than most aftermarket bumpers at 55.5 lbs. Built to last. Winch tubs are .250" steel with a .125" facia for a total of .375" of protection up front! Full height front and rear winch tub. Reinforced lower facia with 3 gussets, adds bashplate protection up front. Will accept most winches with industry standard 10" x 4.5" bolt pattern. Works with either roller fairleads or synthetic style hawse. Light tabs to accomodate most cube style (3") lights such as our Sirius Pro Series LED's. Will permit the use of the OEM Toyota brush gaurd. We offer powder coating in black and silver in a very durable textured powder coat and can do custom colors for an additional fee. Please keep in mind that even though we go to great lengths to protect the coating we are not responsible for shipping damage to any coatings. Expect a 5-7 business day delay in shipping if you want your bumper coated. Read this article for more information. PLEASE READ THE FAQ AT THE TAB ABOVE AND THE ARTICLES BELOW. INSTALL DOCS ARE LOCATED IN THE DOCUMENTATION TAB ABOVE. Does the winch mount come with winch, fairlead or shackles? No it does not. Bare steel winch mount only. It does include the 2 12mm bolts and washers you will need though. Do you offer combination kits with discounts? ​Why yes we do! Look for them in the category of your vehicle below this product listing. These money and time saving kits come with a winch mount, winch and shackles with options for lights and thimbles. They ship free to the lower 48 states via FedEx Ground. Do you ship outside of the United States? If so, how much is shipping? Yes, we ship Internationally and have done so to Europe, Japan, Australia, New Zealand, Chile, Russia, Middle East, well, pretty much every continent, including Antarctica!. It can be expensive as we are shipping a 60+ lb chunk of steel but we are able to ship this in custom made double wall boxes which makes shipping much less expensive than other bumpers. However, we DO have the ability to obtain special pricing from FedEx on a case by case basis. For example, we have shipped to the Middle East for as little as $200-250, Australia for $275-325. Please use our contact form to send us your full shipping information for a quote. Please visit our shipping page for more information. How much does it cost to ship domestically? We ship via FedEx Ground here in the 48 states. Add the product to your cart then go to your cart, there you will be given an opportunity to receive a shipping quote based on your address. Typical costs are $30-40 in the central part of the country and $45-60 to each coast. Please visit our shipping page for more information. What winches fit this mount? Just about any winch will work. Read this technical article in our blog for a more in depth answer. The mount uses a standard 10" x 4.5" bolt pattern so any winch will fit and there is plenty of room in the mount itself. The issue is the bracing behind the FJ grille and the A/C line on 2010 and up models. Tacomas typically have more room laterally and vertically. Because of this something with an integrated solenoid/control box (that is located in the center above the spool) might not clear the bracing without removing some of the brace material and/or relocating the A/C line on 2010 and up models (this typically requires an A/C shop)...but this is VERY rare! We suggest a winch with a relocatable solenoid box or a winch of your choice that shares the same basic design with a remote solenoid/control box, this way you can locate the box wherever you want it. Most winch manufacturers have gone to a smaller control box and/or have made it where you can mount over the winch spool or over the motor (passenger) side of the winch, so typically not a problem. Consider our Combo Kits, they are tried and true! What winch rating do you suggest for this application? Does the front end need to be lifted after installing this mount and a winch? Short answer is maybe. Typically you will see a 3/8" to 1/2" drop by adding the mount (57lbs) and a winch (75-90lbs). This is still a much lighter alternative to a full bumper replacement (75-150lbs without a winch!). In our testing we noticed no difference in how the FJ drove after installation on a stock vehicle. Having said that, because the FJ comes from the factory with some rake (front lower than rear) it wouldn't hurt to lift it a bit to level things out. Read this article about using the Bilstein adjustable shocks to achieve a more level stance and much better ride vs stock for a reasonable price. Will this work with suspension and body lifts? Our bumpers work fine with any suspension lifts but will NOT work with body lifts as our bumper needs to line up with the bodywork but attaches to the frame. A body lift moves the bodywork in relationship to the frame. This shackle works with our FJ and Tacoma winch mount bumpers. Make sure to order a quantity of 2 if you need a pair. Options now available for powder coating in black or silver that matches our bumper coatings with options for OD green and red. Select your option above. Spot beams are better for long distance illumination. Floods are a great combination with the factory headlights for trail illumination. Pricing is per each light. If you need 2 lights then order a quantity of 2. You may also add other options above including cover plates, mounting clamps and multi plug harnesses. However, if you are needing one pair of lights for one of our winch mount bumpers then you will not need any additional wiring or mounts. Just select 2 lights and any cover plates if you want them and that's it. View the Related Products tab above for more light products. If you are looking for custom or OEM style switches please visit our friends over at OTRATTW. 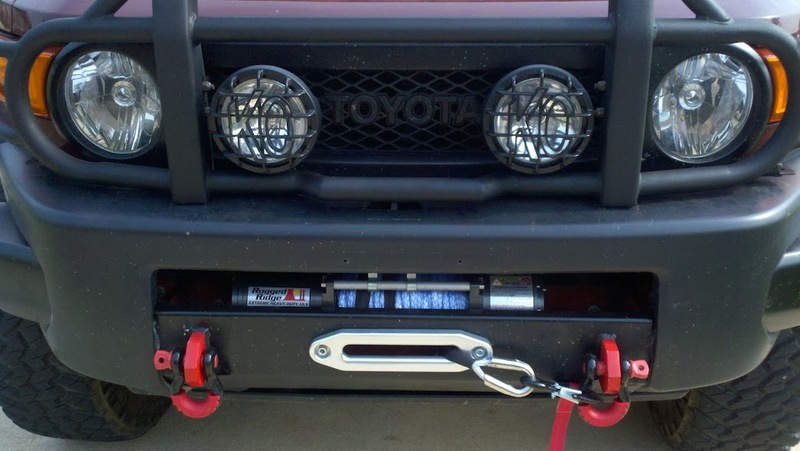 Winch Bumper - Mean Mother 9500lb Winch - Van Beest Shackle Combination for all Toyota FJ Cruisers. Everything you need to install a winch, one of our bumpers and two shackles on your FJ all at a discounted price. Shipping is included in the price via FedEx Ground to the lower 48 states! Please read this if you reside outside of the USA. 1. Our popular FJ winch mount bumper. 2. Mean Mother Edge 9500lb winch with synthetic rope and a remote control. FJ Winch Mount Bumper - Viper 13K Recovery Winch - Van Beest Shackle Combination for all Toyota FJ Cruisers. FREE shipping via FedEx Ground to the lower 48 states on all winch bumper combo packages! Please read this if you reside outside of the USA. 1. Our popular FJ Cruiser Winch Mount bumper. 2. Viper Max 13,000 lb Recovery Winch with black synthetic rope and accessories. If you want to add lights look at the Related Products tab and purchase a couple of the Sirius 2" lights. Note: Main photo above is shown with Sirius lights that are optional. Factor55 thimble not available. Mean Mother built the EDGE series recovery winch to appeal to the 4WD enthusiast who is passionate about quality but wants value for money. The EDGE series ticks all those boxes with standard features not found on comparable winches. Each winch in the EDGE series features a three stage planetary gearbox with sintered steel bushings which have been pressed and stamped (no pop rivets) into the gear carrier. A sliding ring gear clutch provides maximum strength and efficiency in forward and reverse winching operations with ease of free spool functionality. Each gear box is assembled and lubricated using synthetic grease and conforms to our strict assembly guidelines. Providing strength and enduring the pulling forces exerted is a hardened seamless steel drum assembly. Delivering maximum safety during a recovery is an automatic load holding in-drum brake system. Delivering power to the winch is a waterproof solenoid that uses Ag-Cd alloy contacts (Silver cadmium alloy). The technology and quality of these contactors resist arching when switching currents. This prevents the contactors from fusing together creating a closed circuit which can potentially damage your winch or vehicle and possibly serious injury to the operator. This solenoid is housed in a sleek and stylish control box which has a waterproof plug. The heavy duty hand control comes with a 5 metre power cord with the option to upgrade to a wireless remote control which offers the user complete control and flexibility to stand well clear of the winch during operation. The 9500lb & 12000llb series winches use an efficient 12 volt 4.8hp series wound motor. These models offer performance and reliability in the toughest of conditions. We are so confident in the quality and design of our EDGE series winches we offer a limited 5 year mechanical component warranty and a 1 year electrical component warranty. Waterproof contactor (solenoid) system. Compact design, can be permanently mounted on the bull bar or in the engine bay. Waterproof quality plug with protective cap. All EDGE series winches have been equipped with Tinned Coated Copper Power Cables with PVC insulation and the additional protection of a fibreglass outer sheath. Each synthetic rope is fitted with a stainless steel thimble with crush tubing for maximum eyelet strength. Dyneema® is a safer and lighter option than wire cable, and is regarded as the ultimate in performance. The winch is tested to the maximum duty cycle (1 minute) and rated line pull (winch applicable rating) in a dynamic test. This test is performed no less than 100 times and recorded; furthermore the first (1st) cycle is tested to 1.25 times the rated line pull. After the winch has passed 100 cycles without failure the winch and components are passed and inspected. NOTE: All testing was performed with the 1st layer of winch cable on the drum. These tests are designed to examine the overall strength and ability of the winch while observing and recording the important characteristics and operational performance specifications. Please refer to our warranty statement for further details. I am as pleased as can be with this product. The instructions were satisfactory but with the instructions and Youtube videos the installation was smooth and without event. I highly recommend this product for anyone who has even a little bit of mechanical know how. What a great product. A little bit heavy for one person. But it can be done. Got this winch mount to go with my superwinch ts 9500. When I got it I inspected every weld and was blown away by how strong each weld was. it was an extremely tight fit and was completely precise. Ive only used it around a light pole in neutral to give my line tension but if you YouTube this mount, you'll see a man lift his whole front end up with this mount. This is one quality piece of metal work. Just got it powdered coated and I am going to install tomorrow. This is a great product! I had been looking for a winch mount for the stock bumper and came across this one! Very sturdy, easy install, and it weighs a lot, but surprisingly didn't change my MPG at all. Had to use the winch a lot when I went to the desert and the mount held up great!